The 1920s gangster is one of the most popular and enigmatic figures of the Jazz Age. The 1920s was a decade of individuals making their mark in a rapidly changing modern world, and the bootlegging and organized crime that was done in the twenties has contributed largely to the myths and legends of New York and Chicago. The romance of the gangster and the gangster lifestyle lives on today in movies and books that tell the lurid tales of life outside the law, the gangster code of ethics, and the way life is when you learn the lessons of the street rather than the lessons of the classroom. 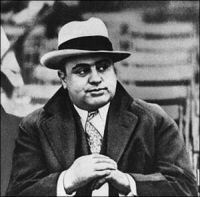 The romance grows thin when you really examine the actions of organized crime syndicates in the 1920s through today. You have to admit that these guys are not the kind of friends you want to invite over for a spot of tea. But the rich 1920s gangster history of their influence on the culture of music and fashion in the Roaring Twenties, lives on because of the gangster's personality and the romance of a life outside the constrains of mainstream society. The "Black" Sox scandal rocked the world of baseball and professional sports, and sent shockwaves through the underworld of organized crime. This really showed how far criminals would and could go to make money in America. The 19th amendment: Women really started asserting themselves in America. The suffrage movement had been successful and women received the vote. Flapper fashion was running rampant throughout the western world. Women smoked and drank like the men. The 18th Amendment: Prohibition was ratified, outlawing the manufacture, sale, or transportation of intoxicating liquor in America. The passage of prohibition did more for the rise of the gangster during the 1920's than anything else. It made alcohol a rare and prized possession, and gave the criminals more than a decades worth of work. The seeming harmless move of a brash Italian thug from Brooklyn to Chicago. That young thug, of course, was Al Capone. A year after received the scar on his face when he was slashed by another young hood, Capone was transferred by Frankie Yale to the care of Johnny Torrio in Chicago. Torrio was an up and coming criminal in "Big" Jim Colosimo's Chicago organization. After his move it didn't take Capone's flower long to bloom in the fertile soil of the Chicago underworld.